The escalating arms buildup in the explosive Middle East bodes ill for that region's future — and poses some knotty problems for Washington policy planners. Massive sales of sophisticated weaponry to the Middle East — scene of four wars since World War II — has transformed that volatile area into "the most militarized region in the world," according to the annual report of the Stockholm International Peace Research Institute (SIPRI). "More than half of the total arms supplied in 1975 went to the Middle East," according to SIPRI's analysis. Middle East arms expenditures are now running at a staggering 16% of the region's combined gross national product — more than triple the percentage average for NATO nations in Europe. In their scramble for new weapons, some Middle Eastern nations have ended up with more advanced arsenals than the countries supplying them! Iran, for example, will soon have, in the words of London's Financial Times, "the most advanced tank army in the world," as a result of a multi-million dollar arms deal with Britain. Without question, the continuing Mideast arms buildup is far and away outdistancing the search for peace. The potential destructiveness of a future war is being raised to unparalleled new heights. The United States. Soviet Union. and other major arms suppliers (principally France and Britain) have dramatically stepped up arms sales to the Middle East and other areas of the Third World in recent years. SIPRI notes that the value of weapons going to the Third World increased by 20% in 1975, on top of a walloping 40% increase the previous year. One reason for the stepped-up arms peddling is the continuing rivalry between the United States — the world's biggest arms merchant — and second-ranking Soviet Union for increased influence in strategic world arenas. In addition, lucrative arms sales abroad serve to bolster trade balances and create jobs at home for the merchant nations. According to the nonpartisan Arms Control Association in Washington. America's most sophisticated non-nuclear weapons — including F-14 fighters, laser-guided "smart bombs," Lance missiles, "TOW" antitank missiles, and Spruance-class destroyers — are now being sold overseas. The Pentagon's principal Middle Eastern clients are Iran and Saudi Arabia — both of whom are buying multiple billions of dollars worth of U.S. arms — and long-time customer Israel, to whom arms deliveries during the current fiscal year alone will total some $1.5 billion. For the first time in 20 years, the U.S. has also started to supply Egypt, which severed relations with the Soviet Union earlier this year. The recent sale of six C-130 Hercules transport planes to Cairo is widely viewed as only the beginning of U.S. arms sales to that nation. Washington is also the major supplier of arms to Jordan, which recently decided to purchase a $540-million American air defense system (with Saudi Arabia footing the bill). Though spurned by Egypt, the Soviet Union is far from out of the Middle East arms picture. The Kremlin is supplying large quantities of modern weapons to Syria, Libya, and Iraq — including advanced MIG-23 fighters, tanks, Bombers, combat helicopters, and artillery. Many of these weapons have already found their way into the Lebanese civil war. France and Britain, the world's third- and fourth- ranked arms suppliers, have relaxed their former restrictions on arms sales abroad, and are now also selling aggressively throughout the Middle East. "The arms buildup in the Middle East shows every sign of being out of control," summarizes SIPRI. "The complexity of the present situation ... has reduced the feasibility of maintaining some form of balance virtually to zero unless, of course, the arms-supplying countries all agree to stop or limit their supplies." Fears are also rampant that for a number of Middle East nations, the chilling step to nuclear weapons may also be close at hand. For U.S. policy planners, the stepped-up arms flow to the Middle East is beginning to raise some serious and heretofore unforeseen questions. A major justification for increased U.S. sales has been the idea that if Washington could become the major arms supplier to the Mideast — selling weapons to nations on both sides of potential conflicts — the U.S. would automatically acquire powerful diplomatic leverage to prevent outbreaks of hostility. But a report issued earlier this year by the Senate Foreign Relations Committee has pointed up some unexpected side effects of U.S. arms sales. The report warned that "the U.S. assumes the Obligation of long-term support for the equipment it has sold. The purchaser becomes dependent on the U.S. in much the same manner as a local automobile dealer becomes dependent on Detroit." In other words. U.S. technicians — both military personnel and civilian defense contractors — are needed by the thousands over long periods of time to help maintain and operate the highly sophisticated equipment being sold to nonindustrial nations, which in many cases lack the know-how to use the weapons they are buying. Much of the equipment being sold by the Pentagon is so complex that even the U.S. military is having difficulty keeping its own forces operational. Iran is a case in point. The Shah of Iran striving to build the largest military machine in the Middle East, has purchased over $10 billion worth of the latest-model military hardware from the United States since 1972 — and that is apparently just the beginning. The Shah has declared his intention to make Iran militarily as strong in ten years as France, Britain, and West Germany are today. He says he needs three times as many weapons as he now has to be adequately equipped against his neighboring enemies. Following closely on the heels of the U.S. arms deliveries to Iran, a contingent of over 20.000 American technicians has descended upon that nation to train its armed forces in the use of their sophisticated new weapons. The Senate report projects that by 1980, that number could easily exceed 50,000. Similar situations exist in other nations being supplied by the U.S. Several thousand American civilian personnel are already in Saudi Arabia, with many more to come as deliveries are made on recently signed arms contracts with that nation. With the U.S. now supplying potential adversaries, the outbreak of war anywhere in the Middle East would pose some serious dilemmas for Washington decision makers. Would the U.S. allow its technicians to remain independent client countries and participate in the hostilities? The Senate study revealed that Iran, for example, could not go to war with its new weaponry "without U.S. support on a day-today basis." The same is probably also true for Saudi Arabia and will increasingly become the case with many other Middle Eastern nations as more and more U.S. arms flow in. If the U.S. reneged on its commitments to keep the arms operational during hostilities, would the resident American technicians be held hostage? And if so. how would the Pentagon react? And what would Washington do when warring client states began clamoring for ammunition shipments, replacement pans, and other critical supplies? The failure of Washington to honor commitments and deliver essential supplies to its arms customers would shatter their confidence in the U.S. and almost certainly result in a dramatic upswing in Soviet influence and arms peddling in the region. The Shah of Iran states the dilemma succinctly: "As far as arms sales go, there are plenty of places to buy. The question is, can you, the United States, afford to lose Iran [or other Mideast clients] either as a friend or as a customer?" The consequences of U.S. weapons sales to the Middle East are difficult to calculate. With no international agreement on the horizon to restrict arms sales to the area, many Mideast analysts in Washington feel diplomatic action to avert war is the only alternative if the U.S. is to avoid being dragged into a future Mideast conflict. But with no Arab-Israeli peace settlement at hand and tensions continuing elsewhere in the Middle East, "the continued unrestrained sale of armaments." in the words of SIPRI, "can only exacerbate an already dangerous situation." 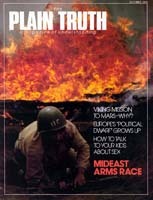 For over 40 years, The Plain Truth has continually urged its readers to keep their eyes on the Middle East. Bible prophecy indicates that region will soon become the prime focal point of world attention — and the tinderbox of a global conflict which will climax in the end-time battle of Armageddon. The escalating arms race now under way is setting the stage for those very evens!